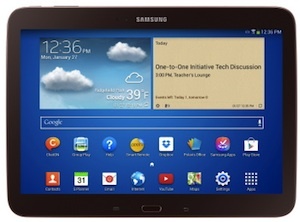 The Samsung Galaxy Tab will feature integration with Google Play for Education. Samsung has taken the wraps off a Galaxy Tab tablet that will be purpose-built for education. According to Samsung, the device, which will be made available for the 2014–2015 school year, will launch as part of the Google Play for Education program. Google Play for Education is a solution that puts approved educational apps and educator-curated resources on mobile devices, along with tools for simplified setup, "instant" app deployment and Web-based management. Content is organized by grade, subject and standard. Google Play for Education also provides the means for school to buy apps via purchase order. "Samsung and Google for Education share a commitment to delivering innovative learning experiences to improve student outcomes," said Tod Pike, senior vice president at Samsung's Enterprise Business Division, in a prepared statement. "The new Galaxy Tab with Google Play for Education integration was created to specifically address the needs of today's schools and support our vision for powering education by empowering educators." The Galaxy Tab with Google Play for Education is expected to ship in April. Samsung's printers and multifunction devices. Samsung is exhibiting in booth 323 at FETC. Additional details can be found at samsung.com/education.